heat oven to 350 degrees. measure flour by dipping or sifting. with hands, mix 1 cup flour, butter and confectioners sugar until smooth. spread thin with fingers in ungreased square pan, 8x8. bake about 25 minutes. stir rest of ingredients into eggs. spread over top of baked pastry (no need to cool). bake about 25 minutes. cool. cut into bars. makes 18 bars. recipe from betty crocker cooky book. 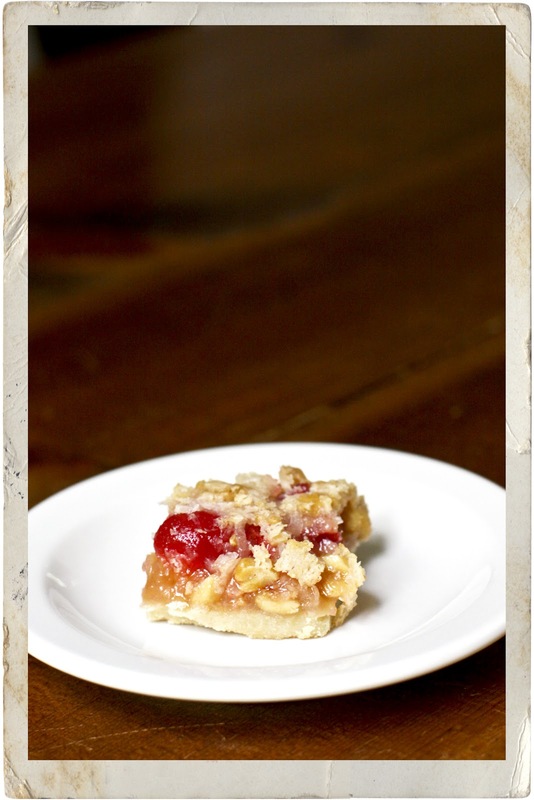 cherry and coconut are a yummy combination, especially with a shortbread crust! and my lovely coworkers all gave them a big thumbs up too!